On March 15, 2001 a panel of four professionals presented their experiences working with digitally printed textiles to the Textile Conservation Group Inc. in New York City. This presentation was a dress rehearsal for a presentation the panel would give at the April 2001 conference of the Costume Society of America in Providence, RI. The following is a summary of the project with an emphasis of the conservation aspects. The panel consisted of Anne Bissonnette, Curator, Kent State University Museum; Camille Myers Breeze, Principal, Museum Textile Services; Joanna K. Cadorette, Costuming Manager, Mystic Seaport Museum; and Melanie R. Carrico, Assistant Professor, Shannon Rodgers and Jerry Silverman School of Fashion Design and Merchandising, Kent State University. In the spring of 2000, Professor Melanie Carrico suggested that Kent State University purchase a digital textile printer. The potential for collaboration with the Kent State University Museum was immediately realized when Professor Carrico printed several banners for Curator Anne Bissonnette’s fall exhibits. Soon Ms. Bissonnette inquired about using a digitally printed fabric to reconstruct the back and side panels of a missing petticoat from an 18th-century brocaded silk open robe. Without the full petticoat, it was impossible to drape the robe “ la polonaise.” The reconstructed petticoat was a success, leading the team to explore further application of digitally printed textiles within museums. Joanna Cadorette, a former student at Kent State University and intern at the Kent State University Museum, was approached about possible use of digitally printed textiles in her job as costuming manager at Mystic Seaport, a living history museum in Connecticut. Ms. Cadorette located a dress in Ohio that would make a suitable model for a dress to be worn by her museum staff. Using a slide of an 1840s printed fabric from the American Textile History Museum, Professor Carrico was able to print yardage using a similar undyed cotton available from Test-fabrics, Inc. of New Jersey. Ms. Cadorette constructed a dress from the printed fabric that is now being worn by one of Mystic Seaport’s costumed interpreters. In addition, yardage of the digitally printed fabric is for sale in the Museum’s shop. The museum field is always cautious when introducing or endorsing new materials and technologies. Digital textile printing is no exception. In order to protect historic artifacts, historic environments, and the people who work with them, digitally printed textiles must be scrutinized on several levels. Do digitally printed fabrics have washfastness, crockfastness, and lightfastness comparable to traditional high-quality fabrics? Are they treated with chemicals or solvents that will off gas or cause a similar threat to adjacent historic artifacts? Are digitally printed fabrics safe for the staff members who are handling them? 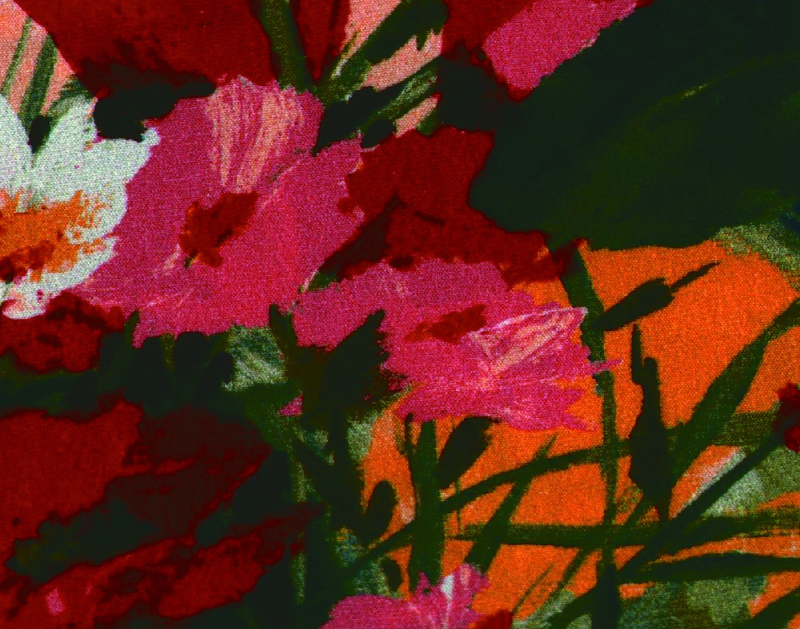 What advantages do digitally printed fabrics have over traditional high-quality fabrics? In order to answer my own questions and those of my colleagues, I conducted a literature search on the topics of digital textile printing hardware, software, dyes and inks, and finally the fabrics and finishes used for digital printing. I specifically looked for references to Mimaki TX-1600S machines, Sophis and Lectra software applications, and reactive dyes. Material Data Safety Sheets for the Azo, Phthalocyanine, and Athroquinone classes of reactive dyes used at Kent State and pretreatment chemicals used by Testfabrics were also obtained. Sample of a digitally printed fabric. Digital textile printing machines are now available that will print on any fabric using almost any pigment or dye. Digital printing companies, such as Sophis, like reactive dyes because they are more suitable to ink jet printing than pigments are and yield more vibrant colors. In traditional textile printing, reactive dyes are surpassed in popularity only by pigment printing. Reactive dyes have achieved their popularity in the textile industry as well as in conservation labs because of excellent fastness to light, washing, and crocking. Cibachron F, the dye used at Kent State, is based on dyes developed in 1979 by CIBA-Geigy Corp. Reactive dyes get their name from the fact that they react, or form covalent bonds, between a carbon atom in the dye and either an oxygen, nitrogen, or sulfur atom at a critical location in the structure of the fiber. In the case of cotton, linen, and rayon fibers, the bond takes place with the hydroxyl (-OH) groups; with wool, silk, and nylon fibers it bonds with the amino (-NH3) group on the protein molecule. In the case of azo dyes the bond takes place between a metal ion and the fiber. It is also distinguished as an azo dye by the presence of the n=N group. This dye is a Cibachron E, which is a monoclorotriazinyl dye. Cibachron F, which Kent state is using for digital printing, is a monofluoro-triazinyl dye. Since fluorine is more reactive than chlorine, it makes Cibachron F dyes more reactive, and changes the behavior of the dye in the way in which it levels, the speed of take up, and other features. In order to bring about a reaction between the dye and the fiber, the fabric is pretreated with an alkali—soda ash, or sodium carbonate in this case. Our fabric was also pretreated with a natural thickener – sodium alginate – which helps to control the coloration, flow behavior, penetration, and migration resistance of the dye. Sodium alginate forms a film that protects undyed areas against accidental marking during the printing process, and washes off easily after print fixation. Urea is a humectant and is used in conjunction with sodium alginate. It helps to keep the fiber wet longer which allows greater reaction time for the dye. After printing, reactive dyes must be postprocessed, traditionally by steaming. Other auxiliaries are used in the dye industry to effect crockfastness, color yield, color penetration, hand, print appearance, runnability, washfastness, and wicking/flushing. One such auxiliary is fabric softener, however fabric softener can negatively effect washfastness of a print and should be removed from fabric prior to printing. I’ll have more to say about fabric softener later. Although reactive dyes are among the highest performers in industry tests, they are among the more dangerous dyes to work with. Because of the aggressive covalent bond, dye particles can bond to the body when inhaled and cause changes to the immune system. Reactive dyes are known to cause respiratory and skin sensitivity. It is very important, therefore, to minimize exposure to dyestuffs, especially in powdered form, and always to wear a respirator when measuring or mixing. There are no known risks to anyone handling or wearing fabric that has been dyed with reactive dyes. In order to confirm the stability and safety of the digitally printed fabrics produced at Kent State, I performed a series of tests on five fabric samples. The tests were chosen to simulate conditions to which the fabrics would be subjected while in a museum environment. These tests are some of the standard ways to determine the stability of a dye; however without access to the analytical equipment, such as a light box with D65 illuminant, an AATCC Gray Scale for comparative measure of color change, or a spectrometer to measure reflectance, I was only able to use visual analysis. Although visual analysis was sufficient at this stage to confirm that the performance of the Kent State fabrics is consistent with standards for industrial reactive-dyed fabrics, further testing is recommended. The fabrics have not yet been tested by me for lightfastness because I did not have enough time or a broad enough sample range. Lightfastness in the museum environment is less important perhaps than washfastness, as any historic textile will be kept in low light, preferably under ultraviolet filtration. The exception to this rule is in a living-history museum where interpreters subject their costumes to the wear and tear of daily life. However as a class, reactive dyes have excellent lightfastness. The samples were tested for washfastness by both hand washing them three times with Orvus WA Paste and machine washing them once with a commercial, dye- and allergen-free detergent. Samples were allowed to dry between washings and were ironed dry following machine washing. Crockfastness was tested by placing each sample fabric beneath a piece of white cotton flannel and rubbing vigorously with a fingernail for approximately fifteen seconds. All samples performed well in crock testing, with no dye transfer. Dyefastness results were also very promising. Out of all the tests performed on the Kent state fabrics, only one sample, a silk crepe, was found to have any movement of the printed design. It showed a noticeable yellowing of the undyed white area immediately adjacent to the printed design. This discoloration was visible after machine washing only. The probable cause for this is the fact that it is a dark pattern with a lot of saturated brown. Problems like this are not unknown with this equipment; Sophis sells a special software feature to help with color monitoring on silk that was not in use when this fabric was dyed. Because of the excellent performance history of reactive dyes and the adherence to this standard of excellence by the companies developing ink-jet dyes, I feel it is acceptable to use Kent State’s digitally printed fabrics in the museum environment. Until these fabrics have undergone further testing and have proven longevity, I would make some basic recommendations. Optimize printing capabilities by preparing the fabric. Wash the fabric at least three times. Mimaki recommends washing once in cold water, once in hot water, then again in cold water. I would recommend an additional wash in hot or warm water using detergent. In addition, all fabrics purchased commercially should be washed prior to pretreating, as most fabrics are treated during manufacture to give them desired qualities such as feel. If you are having an outside company such as Testfabrics pretreat your fabric be sure to tell them where you bought your fabric. As I said earlier, fabric softeners can adversely effect the washfastness of a printed fabric and should be removed prior to printing. As a post-treatment, fabric softener should also be avoided if the fabric will be used in proximity with any historic textiles. Few studies have been done on the effect of these finishes over time, and the commercial recipes are constantly changing. As with any modern fabric, printed or otherwise, whenever possible it should be stored separately from any historic textile. This means that if a stomacher or petticoat has been made for a dress using digitally printed fabric, make that component removable and store it in its own box. This is obviously not an option for support fabrics that are sewn to textiles. There are many uses for digitally printed fabrics that will be of particular benefit to textile conservators. Repairs to historic textiles range from basic to complex, as in cases where the fabric has faded differently in different areas. 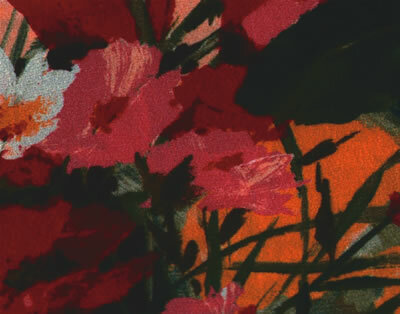 Digital printing allows the conservator to take a digital image of a fabric, isolate each of its colors, and manipulate them to produce more than one shade of the same support fabric. These different colorways can then all be printed at the same time on the same piece of fabric. In some cases it is appropriate to restore a costume or textile so that it more closely resembles its original appearance. Loss of brown or black printed designs is a common occurrence in historic quilts due to the chemicals used as mordants. In this situation, a digital image can be taken of the damaged fabric, the lost color can then be drawn in, and a new fabric printed out that is then sewn over the area of loss. 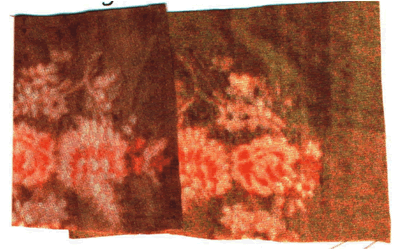 Irregular coloration is very common in archaeological textiles. Until now a conservator would have had to paint on fabric to reproduce the multicolored, mottled effect of the old textile. Now, using a digital camera, a computer, and a scanner, a modern fabric can be printed that closely mimics the original fabric. And perhaps most important of all, this technology will allow conservators access to solid fabrics in every single shade possible. With many mills cutting back drastically on solids, especially in the drab, saturated colors most often used by conservators, it has become difficult to find useful yardage in stores. Perhaps in the near future, conservators will send a color sample to a company, and within a few days they will receive custom printed yardage in any fabric they need. Since this article was first written in spring 2001, advances have been made in the availability of digitally printed fabrics. Tom Klaas of TestFabrics recommends the following companies for short-run, custom fabrics. Super Sample, David Kushner, 119 W. 23rd St. Room 402, N.Y.; (212) 414-1680. LTS Design, Lynda Pfeiffer, 8 W. 36th St. 6th floor, N.Y. 10018; (212) 629-6889. Red Canary, 602 S. Elm St., Greensboro, NC 27406; (336) 379-7571. B3 Design, Sandra Brown, 1801 Cross Beam Dr. Suite E, Charlotte, NC 28217; (704) 423-0336.